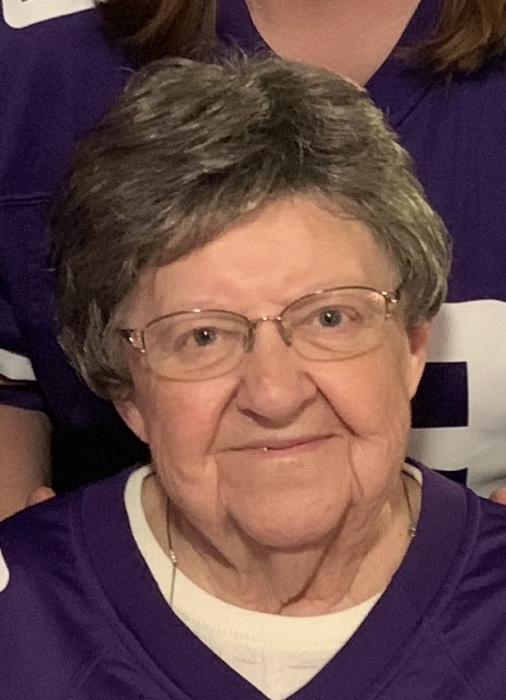 Maxine J. Jensen, 82 of Belgrade, died Wednesday, April 3, 2019, at Paynesville Area Hospital. Her funeral will be 11:00 a.m. Thursday, April 11, 2019, at Grace Lutheran Church in Belgrade. Visitation will be from 5-8 p.m. Wednesday, at the church and for one hour prior to the service at the church. Burial will be in Grace East Cemetery near Belgrade. Arrangements are with the Johnson Funeral home in Belgrade. Maxine Jean Jensen was born April 17, 1936, in Belgrade, the daughter of John and Myrtle (Kalland) Bahe. She grew up on a farm east of Belgrade until 1950, when the family moved into Belgrade. In her youth, she candled eggs, did bookkeeping for Maher’s Department Store and was a cashier at Effie and Elwoods. She attended Belgrade High School and graduated in 1954. On October 21, 1956, Maxine was united in marriage to Lawrence Jensen at Zion Lutheran Church in Belgrade. They made their home and farmed south of Belgrade and she worked as bookkeeper for Belgrade Nursing Home for 33 years, retiring in 2000. Maxine was a member of Grace Lutheran Church where she was a Sunday School Superintendent for 10 years, and was an active member of Naomi Circle. She enjoyed 4-H in her youth on the farm, Aquasize, sewing, knitting, making handmade cards, gardening, flowers and watching her grandchildren’s activities. Maxine died on Wednesday, April 3, 2019, at Paynesville Area Hospital at the age of 82. She is survived by husband of 62 years, Lawrence; children: Vicky (Jeff) Ampe of Paynesville, Marla Jensen of Maple Grove, Julie (Keith) Aeikens of Annandale and Ralph Jensen of Burnsville; 10 grandchildren, 7 great-grandchildren with one due in May and siblings: James (Kaye) Bahe, Gary Bahe and Craig (Linda) Bahe.